Building relationships with clinical sites requires a different set of skills than those of an educator and being a clinical educator at a college is already a full-time job. 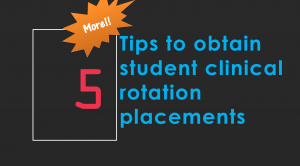 The schools and colleges who are the most successful at obtaining clinical rotation placements for their students put someone in charge, who is dedicated to creating and cultivating relationships with clinical sites. Your college’s NCLEX scores record will eventually make its way to your clinical partners at the hospitals and can be a help or a hindrance in obtaining clinical placements for your students. Announce the scores; especially if they are good. An editorial calendar supported by social media channels will go a long way in creating brand awareness for your school among hospital educator circles. Press releases not only help the college in recruiting students and faculty, but are also instrumental in creating a community presence, which helps in building the recognition and prestige that will support clinical affiliation agreements. Track your clinical affiliation agreements. Make sure they do not expire and set calendar updates to trigger renewal requests and give enough time to hospital educators to address them. Make agreements “evergreen” so there is no need for annual renewals. Online tools such aswww.rotationmanager.com can help you store and keep track of clinical affiliation agreements. Join a hospital foundation, attend and support their fundraising events. Volunteer in charity work organized by your clinical partners and send your students as volunteers. Host free seminars for continuing education credits for your clinical educator peers in the hospitals. Hold events such as: blood pressure and cholesterol screenings for employees, toy drives for children’s hospitals, lunches for nurses week. Save your clinical partners at the hospital some headaches: make sure your student paperwork is compliant for rotations. Send a “secret shopper” when the students and teachers are on rotations. Make sure your students are on time and doing what is expected of them. Utilize tools to manage rotations and student compliance, such as www.rotationmanager.com, which also generate reports the reports your clinical partners need for their audits at the hospital.